JSSC Excise Constable Hall Ticket will also be released in the month of March 2019. Therefore, eligible candidates can download the admit card from this article. Read the post completely for the overall details about the JSSC Excise Constable Examination 2019. The JSSC Excise Constable Examination 2019 will be conducted in the month of March 2019 to fill 518 vacant positions. This is a huge opportunity for the aspirants waiting for the police jobs. Therefore, candidates should prepare well for the examination and garb this chance. The most important thing is that candidates should download the hall ticket before the examination. You can either download the hall ticket using the direct link at the bottom or you can download it from the official webportal – jssc.nic.in. Moreover, the selection process for the examination is in the same fashion given below. Initially, candidates who reach the eligibility criteria mentioned by the higher authorities will get the admit card. Later on, a written test will be conducted for them. Only the selected aspirants will be promoted to the next level. The second round is the physical test round. Here, aspirants should qualify the physical tests like height, weight and so on. Then, the shortlisted candidates are sent for the interview round. Finally, aspirants who clear the interview round will be selected and sent for the training. 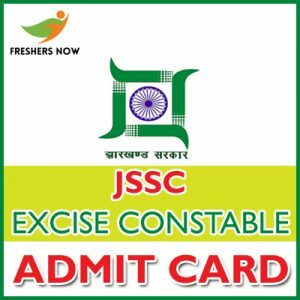 JSSC Excise Constable Admit Card 2019 is very important for the candidates to write the exam. Hence aspirants need to download the admit card a few days before the examination. Moreover, after downloading the admit card, candidates should check the details present on it. If there is any mistake in the details, then it should be corrected before the examination. Furthermore, note down the venue and timings of the examination. Aspirants should arrive at the venue before the reporting time. One of the most important that candidates should carry is jssc.nic.in Excise Constable Hall Ticket 2019. Additional to the hall ticket, candidates should also carry some mandatory documents which are very useful during the verification process. Note down the documents list provided below. Moreover, do not forget to carry passport size photographs along with the identification proofs. To download the jssc.nic.in Excise Constable Hall Ticket 2019, candidates should follow the steps provided below. Also, do not forget to take the hard copies of the admit card after downloading it. Aspirants should enter into the official website of the Jharkhand Staff Selection Commission i.e., jssc.nic.in. On the home page, you can find the important links section. In the important links section, you can find the admit cards module. Make a click on that module. Then, you will get the list of admit cards. Search for the JSSC Excise Constable Admit Card 2019. Make a click on the link and give the details that are asked. Then, click on the submit button after filling the details. We hope that our team had provided you with the complete stuff regarding the JSSC Excise Constable Examination 2019 and jssc.nic.in Excise Constable Hall Ticket 2019. For any further information, you can contact us at freshersnow.com. All the best for all the aspirants.